Aden (AFP) – Overwhelmed by hundreds of sick and wounded each day, hospitals in Yemen’s second city Aden have been reduced to hospices lacking medicines and space as the country’s bloodshed rages on. “The world is watching us slowly die,” said Abdullah Gahtan, a lawyer lying on a bed at Aden’s Al-Sadaka hospital. Like many others in the war-ravaged city, Gahtan is suffering from dengue fever, spreading fast across Aden. The World Health Organization said last month that more than 3,000 dengue cases have been reported in Yemen since March, adding that the actual figure could be far higher. Medical sources in Aden say the mosquito-borne infectious disease has already killed 260 people in the port city in recent weeks. But dengue is only one of the many diseases, such as malaria and typhoid, rapidly spreading across the port city due to deteriorating sanitary conditions as rebels and pro-government forces wage fierce battles. The United Nations has declared its highest level of humanitarian emergency in Yemen, where a Saudi-led Arab coalition has also been bombing rebels since March 26. In addition to some 3,000 Yemenis killed since March, the war has also left 14,000 wounded and displaced more than a million people, according to the UN. It says 21 million, or 80 percent of Yemen’s population, need immediate help and that close to 13 million people are unable to meet their food needs, while 15 million people have no health care. But Aden, capital of the formerly independent South Yemen, has born the brunt of the war. The catastrophic situation in the city was highlighted again by the recent death of two patients suffering from renal failure at Al-Sadaka hospital’s dialysis unit, which was shut down for five days due to a lack of supplies. 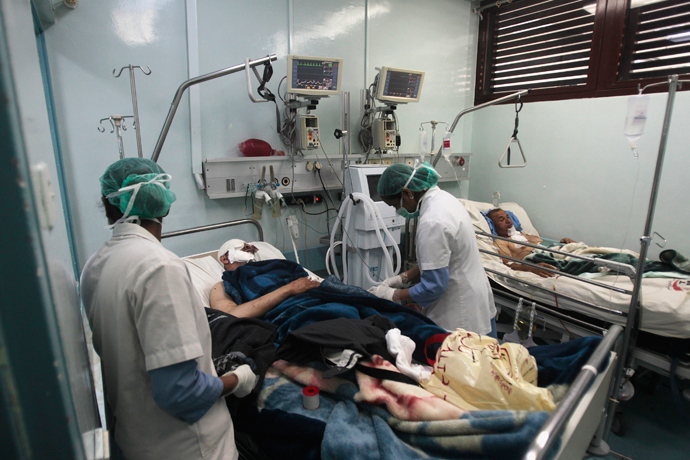 “I wish I had died,” said 56-year-old Saud Saleh Qaed between sobs. Both her legs were amputated after she was hit by a mortar round that crashed near her home in Dar Saad as she ventured out to fetch water. She was admitted to a facility run by Doctors Without Borders (MSF). But with little room available, many patients are camped in corridors, some on mattresses on the ground, others slumped on the floor with limbs wrapped in bandages amid children’s cries and screams. “Many of the patients are unable to go back home because their home has been destroyed or shelled. “So that creates an issue when we have to discharge the patients,” said Thierry Goffeau, MSF project coordinator in Aden. Aden residents and officials accuse the rebels of randomly shelling residential areas of the city with rockets and mortars. MSF says it has treated more than 4,000 people wounded in seven facilities it runs and has managed to deliver 100 tonnes of supplies, despite the dangers and a blockade imposed by both the coalition and the rebels. All public hospitals in Aden face similar problems, from drug shortages to power cuts and a lack of space to admit patients. In Mansura district, the government-run 22 May hospital is only admitting those with serious injuries due to the limited space. “The hospital refused to take in my wounded brother saying there were not enough beds,” said Adnan Zamki. After going from one hospital to another, his brother was finally accepted in a Red Cross field hospital. According to Mouhib Abbad, a member of a local relief grouping, around 5,000 wounded people need treatment abroad. The UN Security Council has urged world governments to dig deep in their pockets after only 10 percent of the latest UN appeal for Yemen of $1.6 billion was raised.